Shams, S., Pourseyedi, S., Hashemipour Rafsanjani, H. (2014). Green Synthesis of Silver Nanoparticles:Eco-Friendly and Antibacterial. International Journal of Nanoscience and Nanotechnology, 10(2), 127-132. S. Shams; Sh. Pourseyedi; H. Hashemipour Rafsanjani. "Green Synthesis of Silver Nanoparticles:Eco-Friendly and Antibacterial". International Journal of Nanoscience and Nanotechnology, 10, 2, 2014, 127-132. Shams, S., Pourseyedi, S., Hashemipour Rafsanjani, H. (2014). 'Green Synthesis of Silver Nanoparticles:Eco-Friendly and Antibacterial', International Journal of Nanoscience and Nanotechnology, 10(2), pp. 127-132. Shams, S., Pourseyedi, S., Hashemipour Rafsanjani, H. Green Synthesis of Silver Nanoparticles:Eco-Friendly and Antibacterial. 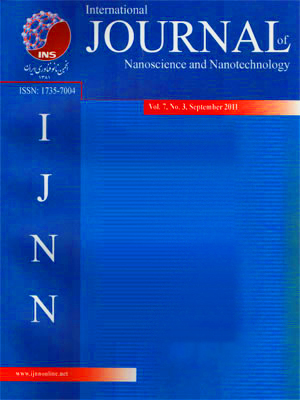 International Journal of Nanoscience and Nanotechnology, 2014; 10(2): 127-132. Nano world daily. In this paper the Lens culinaris seed extract was assessed for thegreen synthesis of silvernanoparticlesat temperature of 25◦C. The nanoparticles were characterized using Inductively CoupledPlasma spectrometry (ICP), X-ray diffraction (XRD) and Transmission electron microscopy (TEM). Thenthe antimicrobial activities of these nanoparticles were investigated. P. aeruginosa and S aureus were used as representatives of Gram-negative and Gram-positive bacteria, respectively. Percentage conversion of metal ion to metal nanoparticles were more than 95% after 60 days of the reaction. XRD was used to confirm the crystalline nature of the particles. Silver nanoparticles were mostly spherical with range in size from 5-25 nm. Ag nanoparticles synthesized with extract were exhibited a strong antibacterial activity against bothP.aeruginosa and S.aureus.This process is completely green and eco-friendly compatible.